If you've been waiting for Square-Enix to continue the bizarre Disney-slash-Final Fantasy crossover that is the Kingdom Hearts series, then ... well, you're going to have to keep on waiting. In 2002, Kingdom Hearts hit shelves, treating people to a truly bizarre blend of Disney's timeless classics with the uber-JRPG sensibilities of Square-Enix in a surprisingly entertaining narrative with a combat system bogged down with an unsurprisingly frustrating camera. 2006's Kingdom Hearts II tugged the storytelling more firmly into the JRPG side of thing while fixing the camera, adding new bells and whistles to the combat system, and making the Disney worlds feel entirely less relevant to the overall scheme of things than they had been before. Despite the release of a slew of spinoff titles like Birth by Sleep and 3.14159/2 Days (or something like that), though, the main story of Kingdom Hearts has been left standing for four years now. Series fans have been clamoring for a sequel since KH2 concluded - so is Kingdom Hearts III in the works? According to Square-Enix big shot Tetsuya "Belts n' Zippers" Nomura, not at the moment - but that doesn't mean Squeenix doesn't want to be working on it. Speaking with Famitsu, Nomura said that even though KH3 wasn't under development at the moment, "Fans and partners alike are pressing us for it, so we'll work to realize it as soon as possible." 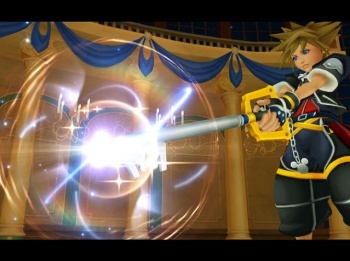 He was tight-lipped on anything further regarding the matter, though, saying that the third Kingdom Hearts could either come from Square-Enix's Tokyo team (makers of the first two Kingdom Hearts games and currently working on Nomura's Final Fantasy versus XIII) or the Osaka division, makers of the PSP Kingdom Hearts: Birth By Sleep. If the former, then it's likely that work on KH3 wouldn't even begin until Final Fantasy versus XIII comes out, which (at this point) is looking to be like some time short of never. So I guess we can expect KH3 to release alongside Diablo III and Half-Life 2: Episode 3, right after the world ends in 2015.